This winter, why don’t you curl up with a bowl of this tasty and Easy Taco Soup! 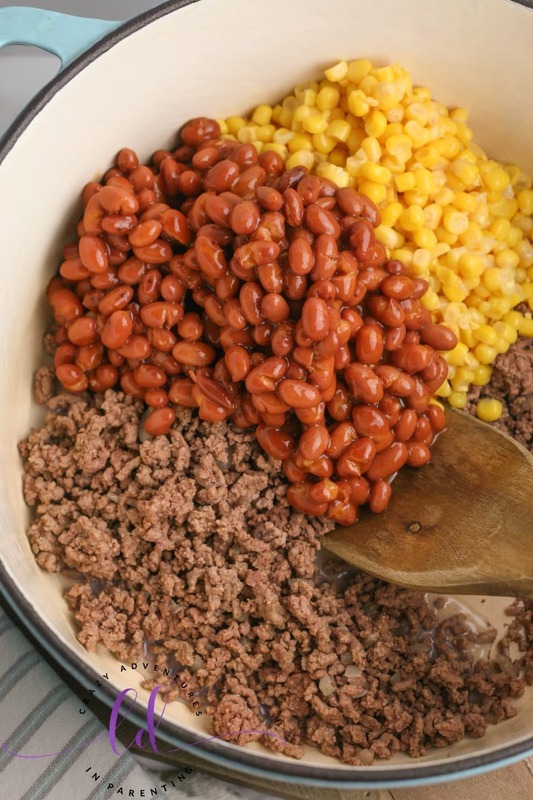 Filled with beef, beans, corn, and tomatoes, you can’t go wrong with this easy soup recipe topped with cheese and taco fixings of your choosing! If you’re in the mood for something warm and filling yet easy and quick, then look no further than this Easy Taco Soup recipe! This quick and easy one pot dinner can be whipped up in no time and set to simmer on the stove for a bit in a Dutch oven or in the crockpot – just set it and forget it! Yes, it’s really that simple! What I love most about this recipe is that it is as easy to please as it is easy to make! While this basic recipe is already wonderful as it is, you can add a little flair to it as you would any taco by serving it with crushed up tortilla chips or tortilla strips on top. Maybe a couple slices of fresh avocado on top, too? Maybe some diced jalapeños to give it a bit of a kick? (Those are most certainly MY favorites on tacos, yesss!) Anything taco-ey that you normally like to have, g’head! This Easy Taco Soup is WORTH IT! Just like I like my tacos smothered in cheese, I looove my taco soup just as cheesy! The cheesier the better is what I think (about pretty much everything, that is)! My kids love it as much as I do! They’re the ones who will eat shredded cheese right out of the bag, lol. Kids, man. You can definitely call us “cheese-a-holics” in this household, for sure! Can’t ever have enough of it, that’s for certain! And the ooey gooey melty-ness stirred right into this soup just elevates the taco flavor even more! So good, friends! Soup in the winter is a must have, isn’t it? Like our famous homemade chili recipe, our chicken tortilla soup recipe, or our potato soup recipe, this one is right up there amongst the favorites in this household! Serve it with a nice crusty slice of buttered bread or a roll, you know? Our delicious corn bread recipe is always a favorite of mine and my children when it comes to pairing well that southwest flavor! Slather a bit of butter on it and go to town! Mmm! If you’re looking for an easy weeknight meal, this Easy Taco Soup is it right here! Something without a ton of fuss! A dish you can set and forget (except for occasional stirring), you know? With kids and extra-curricular activities and the everyday hectic craziness of the busy week, you want something good for your family, you know? Something that tastes amazing, but doesn’t cause you to pull your hair out with too many steps in order to accomplish and get on the table for your family. This soup recipe really is that simple and delicious, I promise you! Whether you’re curled up on the couch with a good book, a Netflix binge session, or with your honey snuggling under a blanket by the fire, this Easy Taco Soup Bowl will warm you up and bring you some much needed comfort on those cold winter nights! It packs really terrifically in a Thermos for school lunches or work lunches the next day too! In fact, I prefer it the day after when the flavors have had a ton of time to marinate and meld together – yes! So so delicious! In a large Dutch oven or stock pot, brown your ground beef. Add in your chopped onions and cook them until they’re translucent. Add to the beef mixture your corn; stir. Do not drain the beef. Add to your beef corn mixture your can of chili beans. Next, add to your beef corn chili beans mixture your can of diced tomatoes with chilies. Carefully pour in your cans of beef broth. Also add in your water and carefully stir. Lastly, add in your packet of taco seasoning. Stir to ensure all your ingredients are well combined. Cook over medium heat until the soup comes to a boil, then reduce your heat to low and cover with a lid. Allow the soup to simmer on low for at least an hour, stirring occasionally. Serve with handfuls of shredded cheddar cheese on top in individual bowls with or without your optional taco fixings, like sliced avocados, tortilla strips, or diced jalapeños. Detailed measurements and instructions for this Taco Soup recipe can be found below 🙂 What do you think about this easy soup recipe? Is this going on your family’s DIY weekly dinner menu board to make throughout the winter? I certainly hope so! Check out some of my other soup recipes, like my famous homemade chili recipe, our chicken tortilla soup recipe, or our potato soup recipe! Don’t forget to check out our delicious corn bread recipe as something to serve with this dish! And if you want more taco lovin’ in your life, check out Mel’s Beef Taco Stuffed Peppers recipe! Also take a peek at all our family’s dinner recipes favorites, too! This winter, why don’t you curl up with a bowl of this Easy Taco Soup! Filled with beef, beans, corn, and tomatoes, you can’t go wrong with this easy soup recipe topped with cheese! In a large Dutch oven or stock pot, brown ground beef. Add onion to the cooked beef and cook onions until they’re translucent. Add into the pot the corn, cans of chili beans, can of diced tomatoes with chilies, cans of beef broth, cups of water, and packet of taco seasoning. Stir ingredients with a wooden spoon until well combined and taco seasoning has dissolved well. Cook over medium heat until soup comes to a boil, then reduce the heat to low. Cover and allow soup to simmer for at least an hour.